Last Sunday, AICUO Intern and Ohio Dominican University (ODU) Senior, Natalie Melchiorre, received an Award of Merit from ODU. Natalie received her award at ODU's Senior Art Show, held at the Wehrle Gallery. 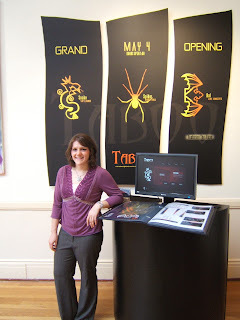 At the show, Natalie featured graphic design work she had completed for a faux nightclub, including a Web site, letterhead, posters, business cards and other promotional materials.